Q: Who can attend Duke Golf School? A: Boys ages 11 - 18 at any skill level motivated to improve techniques in all areas of golf. Students will improve every part of their game from long drives to short putts. Improvements will involve physical technique as well as mental components. Q: Is registration limited to a max number of campers? A: Yes, we limit registrants in order to maintain a low coach to camper ratio of 5:1. Q: What are the camp discounts? A: Please contact us for current discount amounts. Q: Does Duke Golf School provide scholarships or financial assistance? A: Unfortunately, we are limited by NCAA regulations and are unable to provide financial assistance to our camp. Q: What is Duke Golf School’s refund policy? A: Before June 1, direct refund requests to Jamie Green at jgreen@duaa.duke.edu. Registration fee is not refundable for any reason. 14 days prior to the start of camp there will be no refunds for any reason. Q: Confirmation Information & Forms? A: All campers will receive a CONFIRMATION E-MAIL once registration & payment are processed. Campers must have all medical and liability forms filled out and submitted prior to check-in in order to participate in the camp. A: Roommate requests will be honored. If there is no request, roommates will be determined according to age. Q: What Facilities will campers have access to? A: Students will have access to every blade of grass at the Duke University Golf Club. 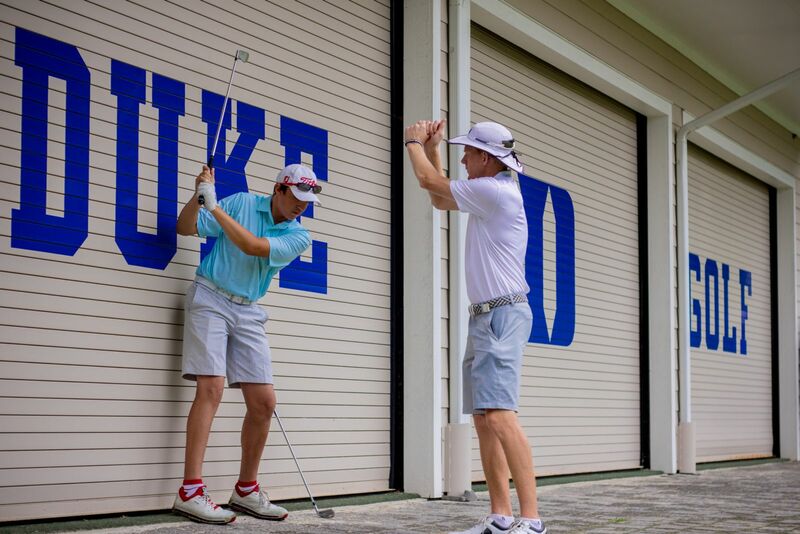 We are honored to have a varsity golf team practice facility which we truly believe prepares our players for every shot they could possibly find on any golf course. Q: What are the Accommodations & Meals? A: Depending on the session, campers will stay in the Duke University dorms, the Dave Thomas Center or the Washington Duke Inn. Meals will be provided by the Duke University dining services or outside catering.